President Emmerson Mnangagwa has assured Kazakhstan business men that their investments are safe in Zimbabwe and that the government is carrying out reforms to improve ease of doing business to ensure companies are quickly registered and able to carry out business in the most effective manner. The President was addressing over 50 businessmen in the Zimbabwe-Kazakhstan Business Forum in Astana, Kazakhstan this Sunday afternoon. “Guided by the second republic’s engagement and reengagement policy, Zimbabwe is committed to deepen and strengthen relations with the government and people of Kazakhstan. Investment opportunities exist in the mining, agriculture, manufacturing, infrastructure development and energy sectors. My government is entrenching a disciplined, consistent and predictable business and policy environment which is free from corruption. Also, as part of efforts to improve the business environment, we have launched the special economic zones,” said Cde Mnangagwa. The President also said private sector participation is an essential ingredient as Zimbabwe embarks on the journey to revamp the economy and achieve vision 2030 of becoming a middle income economy. He added that his visit to Kazakhstan is opportune and is sure to facilitate and increase that country’s presence in Zimbabwe and the SADC region. 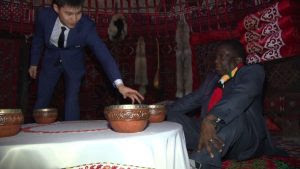 Besides exploring new opportunities on the economic front, President Mnangagwa wanted to understand the history and culture of Kazakhstan as he visited the Bayterek Monument which signifies the establishment of Astana as the capital of Kazakhstan in 1997. From the monument, Cde Mnangagwa visited the national library where he got to know more about the life of President Nursultan Nazarbayev.